A small audio chip is available on the market at low cost (20 euros) that allows to build an audio player managed with buttons or via serial port, for example with Arduino. 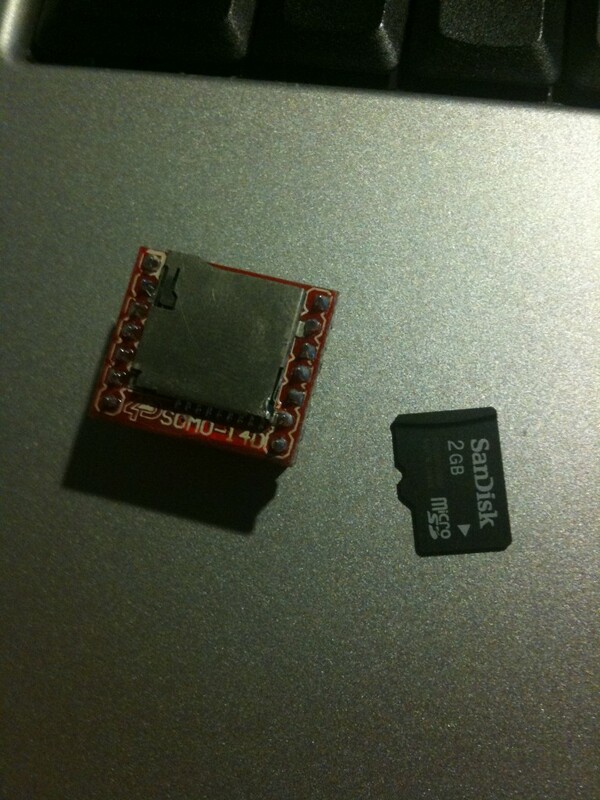 This chip is manufactured by 4DSystems (www.4dsystems.com.au), an Australian company (ahhh the globalization!) which works mainly on LCD graphical modules. Among others, the company also produces the SOMO-14D (link), an audio chip that can play back pre-stored audio files such as voice and music from a micro-SD memory card (max. 2 gb). The files are saved in ADPCM format, that isn’t a popular format, but it is available a practical conversion sw that in a fast mode can convert .WAV, MP3 etc. The module SOMO-14D can be managed in: SERIAL-MODE and KEY-MODE. Using the KEY-MODE the chip works stand-alone and it can be piloted with 3 buttons. 3V for the power and a little speaker (0.5W) are enough. I made the circuit in a breadboard, but I forgot to take a photo, so I have nothing to show about the KEY-MODE. The other possibility is to use the SERIAL-MODE, which allows you to drive the chip with a small microcontroller. Arduino is perfect. There are 4-wires connections and then you can use directly the Arduino to set the play, stop etc. Is available on the internet (link) a sketch that shows all potential of the chip. I got this chip because i’m interested on to make a talking robot. I searched in internet for a chip that may allows to implement a text-to-speech in italian on Arduino, but without good results. It is possible to use a sw on a PC windows to make the text-to-speech. After that you can save the audio file obtained on the SOMO-14D to let the robot to say the right word at the right moment. In particular, I used the the SW DSpeech, that is a good text-to-speech sw.